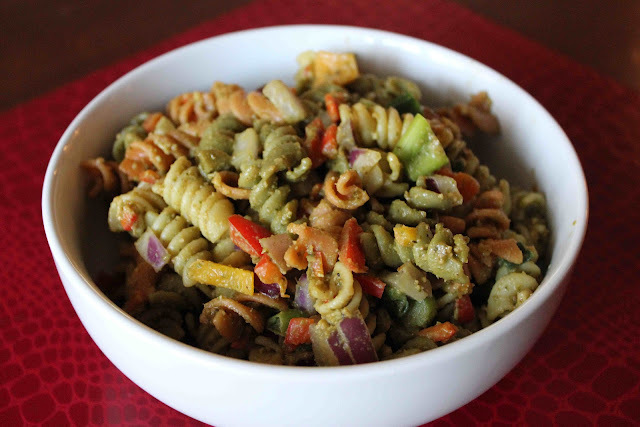 The summer is quickly winding down as Dallas area kids go back to school next week, but before the fall season gets underway, you’ve got to try this wonderful pesto pasta salad! It’s a perfect salad that’s easy to make and light & refreshing for the hot summer months. I don’t know about you, but quite of few of my summer weekends were spent at the lake house jet-skiing, getting a tan, and just relaxing by the water. Between the in-laws and Matt’s aunt and uncle, we were blessed to have had the opportunity to enjoy two Texas lake houses at two Texas lakes! Whenever we visit my in-laws (Tony and Paula’s) lake house, the staple of “lake house” food includes 4-layer dessert, banana pudding, Boog’s chocolate chip cake, handfuls of chocolate peanut butter M&Ms, Paula’s chicken salad, and burgers/hot dogs. Did you catch how many desserts that was!?! Haha….we LOVE sweets and anything Paula makes. 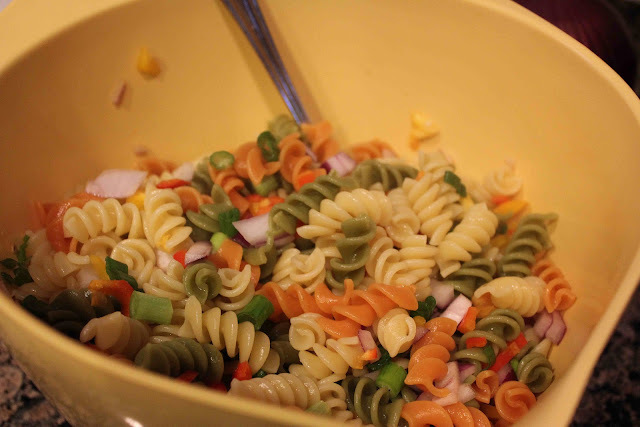 On the second day at the lake, we took the huge pot of cooked tri-colored pasta and added chopped onions, bell peppers, scallions, celery and pesto to create a filling salad for lunch served with oven roasted turkey and sausage. For dinner, we made salmon. What was neat about the Renee’s pesto was that she was able to create two types of sauces using the same base. One was a sweet pesto sauce that was served over the salmon and green salad. The other sauce was the traditional Italian-infused pesto with the nutty Parmesan, olive oil and pine nut flavorings that I just love. 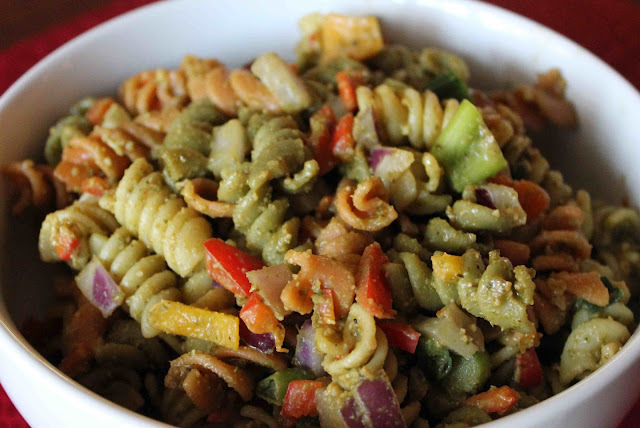 In addition, we also served leftover pesto pasta salad with the fish. 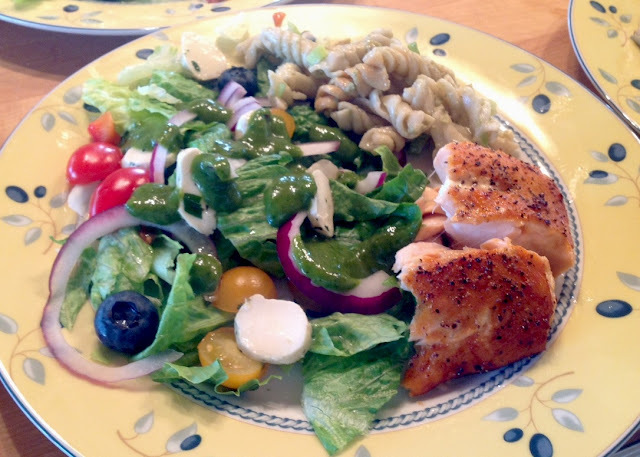 Salmon, pesto pasta salad, and a green salad with sliced red onions, chopped cherry tomatoes, blueberries, fresh mozzarella and sweet basil pesto sauce. Breakfast the next morning was also a treat. Matt’s cousins made chocolate chip pancakes, while uncle Dale and aunt Renee made eggs benedict. In addition we had sliced tomatoes, provolone, Canadian bacon and more pesto sauce to create breakfast sandwiches. It was delicious! As you can see, Renee’s homemade pesto and pasta salad lasted us a weekend for sure! If you can be creative with meals using the same ingredients, you’ll save money on grocery bills, not waste food, and enjoy gourmet food numerous days in a row! 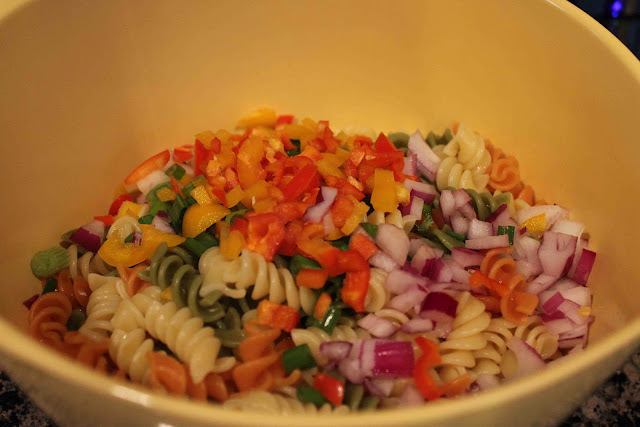 Add chopped red onions, celery, scallions, and peppers to cooked pasta. Combine all ingredients. Then add pesto sauce. Refrigerate until cold. Serve salad cold, as an accompaniment to meat, fish, or poultry. 1. Cook pasta according to package instructions. Let cool. 2. Fold in peppers, onion, scallions, and pesto. 3. Place pasta salad in the refrigerator and chill for at least 2 hours. 1. Place the walnuts, pignolis, and garlic in the bowl of a food processor fitted with a steel blade. Process for 15 seconds. 2. Add the basil leaves, salt and pepper. With the processor running, slowly pour the olive oil into the bowl through the feed tube and process until the pesto is thoroughly pureed. 3. Add the Parmesan and puree for a minute. Use right away or store the pesto in the refrigerator or freezer with a thin film of olive oil on top. Note: Air is the enemy of pesto. For freezing, pack it in containers with a film of oil or plastic wrap directly on top of the air pressed out.